Let me state that I, in no way, I’m a cougar. First, on the cougar scale of “hotness” I would be a three-legged cat with mange and a urinary tract infection. 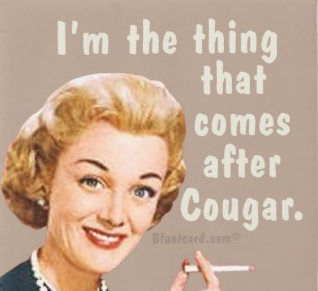 Secondly, I’m married which, I’m pretty sure, disqualifies me from cougardom. My excursion into the land of the cougar was purely scientific. I was there solely to observe and report. An acquaintance of mine, (let’s call her Super Cougar) was kind enough to be my guide into the labyrinth of the cougar habitat – Thursday night Happy Hour. Following her instructions I was to meet her at an upscale suburban bar in our neighborhood at 5:30 sharp. Because I was there only in a reporter capacity I didn’t feel to the need to turbo groom, but I did change into a skirt and attempted to blow dry my hair with the round brush that makes my arms hurt after about five minutes. When my hair was reasonable dry I put on my sandals with an actual heel, some lipstick and was good to go. I arrived at the bar, right on time, and immediately experienced night blindness. Lord, I had forgotten how dark they keep bars.The only bars I usually frequented were the exceptionally well-lit dessert bars at the end of the buffet line. It took me a couple of minutes to spot my not quite a friend but probably now more than an acquaintance – Super Cougar. There she was in all her feline splendor at the bar. A sight to behold. Surrounded by three youngish men she was holding court. They were laughing, she was laughing, and touching them here and there. One guy she touched at the shoulder, another guy she touched his back. It was fascinating. The guys had to be in their late twenties. Super Cougar claimed to be forty-five. But, If I had to guess I would say she was a very well taken care of fifty-five year old. She was hot no matter what her age. Great body, nice cleavage tastefully displayed in a designer top, long hair (blonde, of course), and long legs. You could tell she had been moisturizing everyday for the last thirty years. Hell, I didn’t look that good at twenty. Super Cougar is a successful real estate agent, who at last count had been married three times and was now in her words, “enjoying the attention of younger men who don’t think they know it all.” I say, you go girl. I walked up to Super Cougar and her fan club and said hi. The men gave me the once over and you could tell I didn’t pass inspection. I’m afraid the vibe I give off is “mom with kids.” It could be my perfume – Eau De Tilex or the fact that after I shook hands with the young men I got out my hand sanitizer and asked if anyone needed to Purell. They could tell, right away, I would not be wasting my grocery money to buy a round of drinks. In another couple of minutes Super Cougar’s entourage arrived. It was a pack of fellow cougars that would prowl the bars together this evening. Super Cougar ditched her admirers and all the women sat down together at a table in the back of the bar that had an excellent view of the action. It was here the women mapped out their evening. They planned to go to three bars. The suburban bar we were now at was the “appetizer” bar. It was here they sharpened their cougar claws. Next up was the downtown or “entree” bar where there was a bigger pool of youngish men to flirt with and to finish up the evening it was off to a sports bar. The sports bar had the best ratio of men to women but according to Cougar lore the sports bars are also were the largest number of “loser” guys hung out (and I think by loser they meant chubby and married). From what I could tell the women were looking for a night of ego boosting, flirty fun with young men that made them feel good about themselves. No one was looking to hook up (at least that’s what they told me) or in their words “God forbid” start a relationship. I hung out with the Cougars all evening and all I can say is the Cougs were a whole lot more interesting than the prey they stalked. I am now old enough to proclaim that: A large quantity of young men are boring, egocentric, lacking in good manners, spoiled, cheap and most, if not all, are afflicted with some form of ADHD due to massive amounts of time spent video gaming. Plus, since I do hail from the South I can also say without smirking that a gentleman never lets a lady buy him a drink. That pretty much sums up what I think of the Cougar’s prey. I just don’t see the attraction. Alpha Cougar (also known as Super Cougar): This is the premiere cougar. She is usually one of the older cougars but also the best looking. Her signifying marks are long, flowing locks, the ability to stride through a bar in very high heels and sit on a bar stool in a super short skirt without appearing vulgar. She commands attention and attracts the looks of not just the males in the bar, but also younger non cougar females. They know to be afraid and will place their paws on their males as a sign that they are taken. The Alpha Cougar considers all males fair game and will not be deterred by any territorial displays. She owns the room. Young women take note. This cougar has claws and will take you down. You may have youth but she’s got the kind of seductive confidence that only comes from experience. Big Money Cougar: Money is no object to this cougar. She drives a vintage sports car, just got back from an expensive trip and likes to buy drinks for any male under forty. Big Money Cougar is, of course, very popular. While, not always the hottest cougar her bucks more than make up for it. Her signature move is letting the twenty something men “sit” in her sports car in the bar parking lot. Big Money tells the boys if they’re lucky one night they might get to drive her and the car home. Cougar-In-Training: This woman is a borderline cougar. She’s almost, but not quite, old enough to officially qualify for cougar status. She views the cougar outings as a chance to check out what her future holds. Most of the other cougars view her as a young competitive poacher trying to intrude on their prey. Approval from the Alpha Cougar is needed to allow the C.I.T. into the pack. Glamorous Cougar: Do not make the rookie mistake of confusing the Glamorous Cougar with the Alpha Cougar. The Glamorous Cougar while very attractive and stylish doesn’t possess the confidence or the skill of the Alpha Cougar. Usually the Glamorous Cougar is newly divorced and can be either a little too needy or too aggressive. Either of those traits can scare off the younger prey. The Glamorous Cougar excels at turning heads – young and old. She delights in giving middle-aged men (i.e. her ex-husband’s age) the cold shoulder while courting the attention of the young 30 ish set. Grandma Cougar: This cougar is in her 60’s, (although in a dark bar she can easily pass for 15 years younger) has seen her fair share of action and knows it’s probably time to entertain the thought of perhaps dating men in their late 40’s but the attention of much younger men has become like a drug. She has a fitness regimen that would probably tire a Navy Seal and her grooming is flawless. Yet, her hands and non bar lighting give away her true age. Grandma Cougar shuns sunlight like a vampire. Sorority Cougar: This cougar is trying to relive her glory days when she was her sorority’s social chairperson. Sorority Cougar is always trying to plan mixers, I mean functions outside the bar environment. Movies, restaurants, etc. She hasn’t yet caught on that most Cougar relationships don’t exist in the alternate reality of the non-bar universe. Sorority Cougar is seen as a fun, safe cougar and is befriended by less sophisticated young men that feel threatened by the Alpha Cougar. Sporty Cougar: Sporty Cougar is most at home, you guessed it, the sports bar. She knows her pro sports and NCAA Final Four brackets like an ESPN reporter. She also runs marathons, has done “just a couple” of triathlons, and plays any and all co-ed rec sports. Sporty Cougar excels at being one of the boys. Her signature move is challenging young men to try to keep up with her on one of her daily runs. Sporty sees the challenge as a “safe” date that could lead to more action. The young men are so sure of their ability to out run the cougar they have no idea they are being played. Wanna Be Cougar: This little kitty is a timid cougar. She wants to go off with bigger, leaner and meaner cougars and hunt but just doesn’t have the claws for it. She hangs back in all group activities and is the last one to belly up to the bar. Her trademark move is waiting for the Super Cougar’s leftovers. From my research I have concluded that for a woman to qualify as a Cougar she could be as young as 40, but she has to go after very young prey. For example, a 40-year-old woman who goes after a 23-year-old college students fits the Cougar Criteria. But a 40-year-old woman who buys a drink for a 35-year-old man is not a Cougar. It is all in the age differential. While I do not totally understand the attraction the Cougar has for the younger man I’m all for equality. Men have been actively hunting younger woman since before we discovered fire and the wheel. So, for you Cougars out there – meow baby, meow. Bridezilla – May I Slap You Now or Would You Care to Wait Until After the Reception? A big thank you. As I sit here enjoying my glass of wine and pizza rolls (don’t judge me). I enjoyed the cougar entry a great deal. I know of one friend in particular, who will be one ravenous cougar…… And in the mean time Ill fantasize over the traffic cop who pulled me over a few years ago and commented that I was too young to be driving a Expedition (Im a Texan, minivan wont happen)……. Never Fear, I would never judge anyone’s food choices since today I’ve consumed four Reese’s Peanut Butter Cups (full size) and half a Hershey bar. SO TRUE!!!!! RFLMAO!! It was great to read this first thing this morning, got my day off to a great start. LOL! I loved reading this. I went out with a couple of single friends about a year ago, and I left feeling like a dried up old prune. I came home and made my husband promise he would never leave me! —Hilarious….that would definitely be me!!! When I drop 20+ pounds and can walk in heels again without grimacing in pain from big toe that has decided to reject me…I may go on a cougar field trip of my own, but just for fun. I too do not really see the attraction to younger men, but it would be hilarious if one were ever seemingly attracted me. Bwah ha ha haaaaa. As one-time Cougar prey, I can tell you ladies that the thing that appeals most to a man is sincerity. Once you learn to fake that, there’s no limit to what you can achieve. Okay, so I stole it from Sam Goldwyn. That was a great laugh for my morning…spilled coffee all over my keyboard! Its interesting that there are categories of cougars but the way that you speak of their prey being boring just shows your own personal bias. I find most cougars to be boring themselves for the simple fact that they’re just there playing the game and i guess as one that doesn’t play those games, they hold no interest for me. They did once when i thought they were more mature but clearly thats in body alone, not in mind. Plus, mentioning that they hunt younger guys that don;t know it all sounds like the cougar is intimidated by someone that isn’t afraid to challenge their views, i mean what the cougars do now is something most guys do when they’re young, the fact that these cougars didn’t learn to play the game the same way until after 40… well i didn’t know the learning curve was that steep. The fact that you blame ADHD on video games shows your lack of knowledge on the subject so i can’t even address that but there is nothing wrong with a woman buying a man a drink, its called “Being your own person and making your own choices” i mean you don’t even have to be Feminist, just be a confident, independent woman, its the 21st century. I think the issue is this antiquated view you have on young men, times of changed, if the cougars can see and understand this, maybe you should give it a second look. Honey, I’m 63 years young and I am a cougar. All I’ve got to say is you nailed it. Younger men are easy and at my age that’s what it’s all about. No muss. No fuss. While I am happily married with 3 kids, this made me belly laugh (yes, it jiggles) and take a 2nd glance at my hands and nails. Funky hair color, has helped me maintain my “can I see your ID?” look. Now I need to go get my Eau de Tilex and get back to reality. I worked with a “Grandma Cougar.” The other Coworkers and I referred to her as “Vaginasaurus Rex” or “V-Rex” for short! You not only lost me at this line “most, if not all, are afflicted with some form of ADHD due to massive amounts of time spent video gaming,” you disappointed me. I realize you write humor, but damaging myths and stigma are spread in all forms of communication. I come from a long line of people who have (or had, going back generations) ADHD, and the brain science shows that it’s a disorder of brain function that has been going on since long before there were video games to play. This is not to suggest I support long hours of game-playing, I absolutely do not, but I am aware of how this physical brain disorder leads some sufferers to spend a lot of time gaming and how parents and other family members who choose to deny the fact that ADHD could occur in their family and choose not to become educated about it only make it all the more likely that their child will use excessive game playing as one of their methods for coping with the effects of ADHD. Please educate yourself a little before making so-called humorous remarks at the expense of people who have serious brain function issues. That only makes it harder for their families to accept ADHD as a real disorder that was not brought on by the sufferers own actions and to recognize the need to help the sufferer seek out better alternatives to constant game playing. Thanks.